The recruitment search: where and how can you find your ideal candidates? Last week, the Office for National Statistics (ONS) released their latest UK employment statistics (updated to 31 August 2018). These showed that 75.5% of people aged 16-64 are currently in paid work, and unemployment stands at 4% (its lowest rate since the mid-70s). However, we all know that we shouldn’t lose control of ourselves with excitement just yet. Despite the positive headlines, far too many people remain out of work, and ‘underemployment’ is becoming one of the big issues of our time. Interesting then, that on the other hand we have a ‘candidate shortage’, ‘skills shortage’ and ‘talent crisis’, and are currently in a ‘candidate’s market’. I should clarify here that I recruit solely for financial services businesses, so my comments in this respect relate purely to my specific sector. Over recent years, a common complaint I’ve heard from financial advisory and wealth management firms is that they’re finding it harder and harder to find the right people. Often, this complaint is made to me immediately before a comment such as “so we’re going to have to fork out to get you to help us on this one” (and clients that I know particularly well might even follow up with a jibe or two about recruiters!). Of course, the more niche your business or vacancy is, the harder it will be to find the skills you need. However, one thing I’ve noticed over the years is that employers sometimes make things harder for themselves in this respect. It’s easy to fall into the trap of being too blinkered when looking for relevant experience, and therefore missing highly transferrable skillsets that people have gained on an alternative path. Once you’re clear on who you want to recruit, you can start your search. There are a number of ways to find candidates and the best routes for you will, of course, depend on your business, budget and the role(s) you’re looking to fill. Wherever possible, as a starting point you should advertise the role internally. No-one understands your business better than you and your current team. The perfect person may already be right under your nose. Even if there isn’t anyone suitable internally, one of your existing team might know the ideal candidate(s). Operating an employee referral programme – even an informal one – can be a great way to find new recruits. Nowadays, there are more ways and places to advertise than we could ever have dreamed of a couple of decades ago. Choice is great, but too many options can be confusing and make it difficult to know where best to target your efforts (and spend!). An obvious starting point is your website – most organisations now have sites they can quickly and easily update themselves. Outside of your own site, it again all comes down to your specific requirements. Local publications and their websites can be great in many cases, as can job sites or Jobcentre Plus. For junior roles, you can look into modern apprenticeship schemes or graduate placement programmes. For more senior or technical hires, or roles that require specific qualifications, industry publications and websites are likely to be more appropriate. When advertising, as well as outlining the skills and level of experience you need, remember to ‘sell’ the role and your business. See my last blog on recruitment planning for some tips on writing job descriptions and adverts. It’s often helpful to include an indication of salary or salary range, rather than just stating ‘negotiable’. Being more specific about the salary level can greatly increase your chances of relevant candidates being attracted to your advert. Don’t forget (and this hopefully goes without saying), you should ensure your advert does not discriminate – even inadvertently. If your business already uses social media then, much like your website, it makes sense to also promote your vacancies here. Some social media platforms, such as LinkedIn, were specifically designed for professional networking and even have dedicated areas for posting job vacancies. Specialist recruitment consultants are the obvious choice for helping you find and attract high-quality candidates. A good recruitment consultant will have access to a far wider candidate pool, along with the necessary skills to match ideal candidates to the role and organisation in question. The most successful recruiter/employer relationships are those based on long-term partnerships. Your recruitment consultant should feel like a natural extension of your business. The more they know and understand your organisation and culture, the better placed they will be to put forward candidates who really meet your needs. Does your consultant have any specialist recruitment or HR qualifications, for example the Certificate in Recruitment Practice? This helps to demonstrate a level of knowledge, understanding and commitment. Does the organisation specialise in your particular industry sector? Industry specific knowledge and experience is extremely valuable and can really help you get the maximum benefit from your recruitment partner. The best recruiters are often those who have previously worked in your industry – this really makes a huge difference to their level of understanding of what you are looking for and trying to achieve. What do other people say about them? Speak to your colleagues and peers to see who they would recommend. Do they have testimonials on their website, or positive Google reviews? As with any service provider, a good recruiter should also be happy to let you contact their existing clients for references. 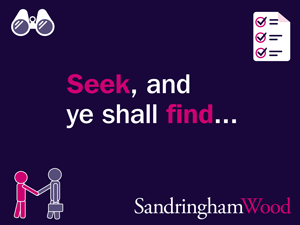 However you choose to search for candidates, remember to make it clear how they should apply. This could be via a specific application form you have put together or requesting their CV with a covering letter (or even both). If using an application form, again be careful not to include any questions that could be construed as discriminatory. This includes things like asking for the candidate’s age or date of birth. Next time, I’ll be looking at how to effectively filter through applications and get the most out of your interview process. In the meantime, feel free to leave any comments below. Sandringham Wood exceeded my expectations of any recruitment company. They clearly understood my situation, experience and which roles I would be best suited for, along with which roles would be most desirable for me.